I have written a few posts that begin with the warning ‘Don’t try this at home’ – advice that is particularly important to follow when you read about this extraordinary real-life version of Up. Jonathan R. Trappe is a ‘cluster balloonist’. I never knew there was an official sub-category of ballooning called cluster ballooning, but Trappe is certainly the poster boy. He recently set himself the challenge of crossing the English Channel under a giant cluster of toy balloons. It’s not his first flight powered by balloons. 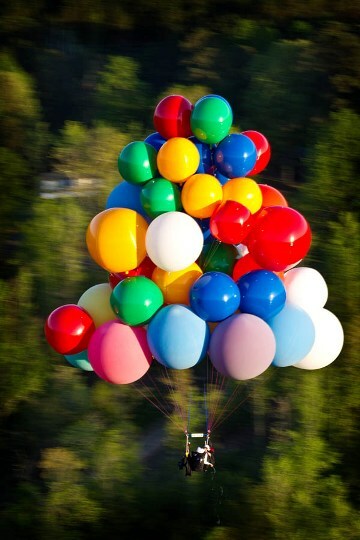 He has had many real-life Up adventures (for those of you who are not familiar with the Disney Pixar movie Up, it is the story of an old man who attaches hundreds of balloons to his house and floats away). Trappe made it across the English Channel. 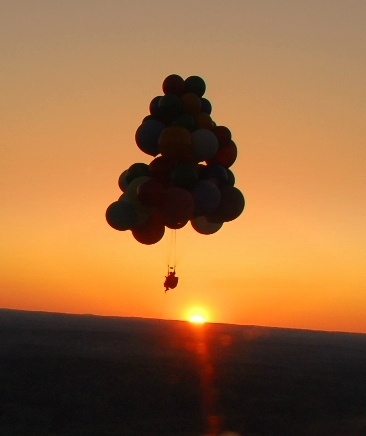 Using fifty-two balloons, it took more than four hours to complete the thirty-five kilometre trip. Trappe cut off a few balloons to aid his descent into a cabbage patch near Dunkirk, France. Obviously a great deal of planning and training goes into these balloon adventures – I am going to keep my chair firmly on the ground but it is exciting to know that some people don’t let go of their childhood dream to fly.